Bananarama offers prime beachfront real estate for active guests in popular West Bay. Photo courtesy of Bananarama and Devon Stevens Photography. Family-friendly and action-packed, Bananarama sits in the heart of West Bay beach and offers anything and everything you might want to do on an island. The on-site dive operation is popular among guests, and their activity booth on the beach covers the rest from parasailing or charter boat day-trips, to Flyboard or fishing. If you’re looking to keep the kids or your friends entertained, you can’t miss Bananarama. Activities offered: The activities booth is run by Roatan Tours, offering an all-encompassing variety of activities. The on-site dive shop features 4 boats, small group sizes, and experienced dive masters and dive instructors. Bananarama is the activities hub of West Bay. Special Events: An in-house wedding coordinator makes all necessary arrangements for celebrations. Most of the weddings are hosted in the Island Pearl area with receptions or rehearsal dinners at the Vintage Pearl Restaurant and Wine Cellar. Recommended for: Families, young couples, groups of friends – this is an active, vibrant resort with something happening day and night! Relax on the beach at Barefoot Cay, where you are ferried to your private oasis away from the rest of the world. Photo courtesy of Barefoot Cay. Located between Brick Bay and French Harbour, Barefoot Cay offers a secluded retreat from the norm. With guest capacity at a small 26 total, you will never feel like just a number in a hotel. Barefoot Cay prides itself on exceptional service, boasting a staff of 40 to meet your every need. The on-site dive operation offers full valet service and the full range of PADI courses. Perfect for an adventurous week filled to the brim with diving or a secluded romantic getaway. Total number of rooms: On the private cay there are (2) one-bedroom bungalows and (2) two-bedroom villas. Above the dive shop there are (3) ocean-view studio lofts and (2) ocean-view two-bedroom loft suites. On-site dining options: Poolside restaurant for breakfast, lunch, and dinner as well as a full range of beverages. Also the Barefoot Grill, located next to the Barefoot Divers building, where they host weekly pig roasts on Wednesdays and kebabs on Thursdays at lunch. Activities offered: The dive shop on-site is Barefoot Divers, offering full valet service. Guests can also use complimentary kayaks and stand-up paddleboards. The resort also has spa services including massages, body treatments such as scrubs and wraps, facials, pedicures and manicures. Special Events: Weddings, dive groups, yoga retreats, family reunions or corporate retreats. The Beach House, located on Half Moon Bay in West End, Roatan. Photo courtesy of The Beach House. Located in the heart of popular West End, The Beach House is a prime location for anyone looking to enjoy a fun vacation. Dozens of bars and restaurants line the street and any number of activities are available only steps from your room. This perfect location combines with The Beach House’s high-end accommodation and excellent service to create a vacation you won’t soon forget. Suite-style rooms open up to fresh salt air – you absolutely cannot get closer to the ocean than The Beach House in West End. On-site dining options: The Landing Bar and Deck. Breakfast is included for guests and is served as a continental buffet. The Landing is open the remainder of the day for guests to order to their room and is also open to the public during those hours. Activities offered: The Beach House Concierge is West End’s premier concierge service. Open and free of charge to guests and non-guests, arranging everything from flights on CM Airlines and Tropic Air to transport to Utila and the other Bay Islands. They also arrange fishing trips, day trips to Cayos Cochinos, restaurant reservations, and they have an in-house private chef for guests who also offers catering outside of the hotel. Grand Roatan Resort enjoys a quiet location at the far end of West Bay Beach. Photo courtesy of Grand Roatan Resort. At the far end of West Bay beach by the iron shore you’ll find Grand Roatan Resort. Boasting brand new, state-of-the-art condos ranging from 1-bedroom to 3-bedroom, Grand Roatan is absolutely not to be missed. The incredible grounds offer paths cutting through beautiful landscaping and a perfectly designed beachside pool, complete with swim-up bar service. The on-site restaurant, Iron Shore Bar and Grill, offers the area’s most extensive seafood menu paired with a fun cocktail list and fantastic service. Grand Roatan is also very community service-oriented, offering their staff one paid day off per month to give back to their community. From beach clean-ups to building schools, this resort is focused on sustainability and giving back to the Bay Islands. Total number of rooms: One beachfront building and one ocean-view, both with 1- , 2- , and 3-bedroom condos that include kitchen, living room, sofa bed, and a terrace. On-site dining options: Iron Shore Bar & Grill with a Palapa Bar for guests and the general public. This is the best seafood menu around and is not to be missed, whether you’re staying at Grand Roatan or not. Activities offered: Exclusive professional spa services. Special Events: Weddings, anniversary celebrations, corporate retreats. Stunning grounds and a gorgeous view from the pool at the luxurious Las Verandas. Photo courtesy of Las Verandas. Offering the utmost in island luxury, Las Verandas combines beauty of nature with state-of-the-art amenities. Located at Pristine Bay, a high-end private community featuring an 18-hole golf course designed by Pete Dye, Las Verandas offers the reprieve you need from hectic work schedules at home. All of your needs are met on-site, from scuba diving to spa services, full concierge treatment means all you have to worry about is whether you’ll play a round or order another cocktail poolside. For luxury in Roatan, Las Verandas takes the prize. On-site dining options: Las Pergolas Restaurant (breakfast and dinner dining options available) and The Palapa Pool Bar (casual lunch, and pool side drinks and afternoon snacks). Both options have full bars and lounge areas and are open to the public. Activities offered: Black Pearl Divers is located in the Beach Club right next door to Las Verandas, guests may book through the concierge service at the hotel front desk. The concierge service offers everything from island tours to catamaran sails – simply ask and you shall receive. The view from the infinity pool overlooking the beach at Mayoka Lodge. Photo courtesy of Mayoka Lodge. Mayoka Lodge is a boutique option in Sandy Bay, convenient to both the airport and the popular restaurants and nightlife of West End. Secluded suites tucked into the jungle overlook the beach, providing guests with convenience and privacy. The on-site restaurant, Frangipani, is as popular with local expats for an upscale night out as it is with guests. The convenience of this location offers a wide variety of activities to access while staying clear of the busy touristy spots. On-site dining options: Renowned Frangipani Restaurant for breakfast, lunch and dinner. This public restaurant is a favorite among expats for upscale dining. Activities offered: Staff can assist in scheduling any of your desired activities. Proximity to Anthony’s Key Resort makes the dolphin snorkel/dive excursions quite popular. 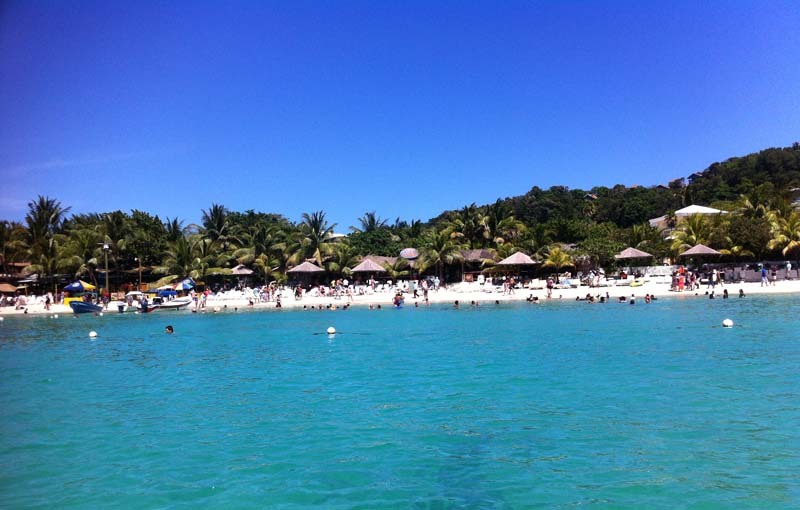 Turquoise Bay Resort sits on prime beachfront real estate in Roatan. Photo courtesy of Turquoise Bay. The popular Subway Watersports dive operation at Turquoise Bay often brings groups of scuba divers and snorkelers looking for a week of fun underwater. Its north-side location in Roatan offers some of the island’s most beautiful – and less visited – dive sites. Enjoy a relaxing vacation with a perfect mixture of water activities and beach lounging, away from all crowds. Activities offered: Dive shop on-site offers daily diving or snorkeling at the incredible north-side dive sites of Roatan. For other activities, ask at reception. Xbalanque is a modern, boutique luxury resort in West Bay, Roatan. Photo courtesy of Xbalanque. Named for a Mayan god, modern design meets pristine nature at Xbalanque. This boutique resort caters to its guests like no other; whatever your request, they will make it happen for you. Located between West End and West Bay, Xbalanque benefits from proximity while offering guests privacy and serenity. Whether you want to lounge in a beach chair all day interrupted only by an occasional snorkel or spend your days exploring every part of the island, Xbalanque provides the perfect location for all of its guests’ needs. On-site dining options: 5-star private chef serving breakfast, lunch, and dinner. Not open to the public. Cooking classes are also available! Activities offered: Guests have use of kayaks, paddle boards, and snorkel gear. They also just completed a new pavilion that will be used for yoga, exercise, music, and receptions. Their preferred dive shop is Quality Time Divers. Special Events: Yoga retreats, corporate retreats, family reunions, and small weddings. Whatever your travel style, Roatan has a wide variety of resort and hotel options available to fit your needs. These are only the beachfront resorts – many other options for accommodations are available to suit all budgets and needs. Wherever you stay, you’re bound to fall in love with the island. Take a look at my tips and advice for travel to Roatan here. Don’t forget to subscribe to my newsletter to continue getting valuable information sent straight to your inbox. You can also keep up with me on Facebook, Instagram, and Twitter. Let’s be friends!